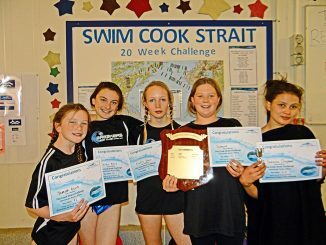 Recently Ōtaki Pool celebrated the end of their 20 week pool challenge to cross Cook Strait without leaving the pool. During this time the public were encouraged to walk, swim and even Aqua-fit their way through a gruelling 2790 lengths the equivalent of 92km, with prizes being donated by Interislander and 2 fishing vouchers from Pete Lamb Fishing. It was wonderful to have these companies support this challenge. There was also a shorter challenge of 26km on offer for those who would not be able to complete the longer distance in time, making it attractive for people of all ages and abilities. This is the second challenge to be held for the Ōtaki Pool Challenge Shield. The first was last year with a Round Kapiti Island Challenge. Participants have come from as far away as Wellington to Levin with some only able to take part in the weekends. Taimana was awarded the Ōtaki Pool Shield for the longest distance completed by a competitive swimmer. She was the only person to complete the challenge twice and was a third of the way across on her third crossing. Santana Chapman was acknowledged as the person who completed the most lengths in one session. The Coastal Wanderers Swim Squad parents also entered a 4 person team and completed 95km between them. It was a great and fun way to use the water to encourage more spectators into the water rather than sitting on the sides watching. Penny, one of the parents, has remarked that being part of the team has helped her back into the water rather than just observing from the sides. The idea of being part of the Coastal Wanderers Swim Squad team took a lot of the pressure off trying to achieve it alone, but has given her the incentive to try and go it alone next time. Everyone is looking forward to the next challenge and curious as to what form it will take. All acknowledge the hard work that was put in place by all the office, reception and lifeguards whose genuine enthusiasm for helping people no matter how many or few lengths that they achieved.